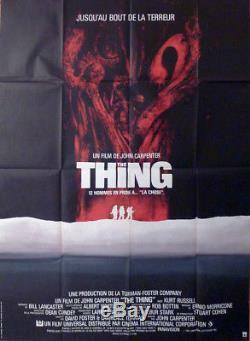 ORIGINAL LARGE FRENCH MOVIE POSTER OF " THE THING ". SIZE : 47X63 INCHES (120X160 CENTIMETERS). POSTER IS FOLDED IN NEAR MINT CONDITION. OVER 20 YEAR IN THE MOVIE POSTERS BUSINESS. WE OFFER THE LARGEST CHOICE OF OLD AND NEW FRENCH MOVIE POSTERS. FRENCH MOVIE POSTER SHOP IS APPROVED BY LAMP. POSTERS ARE SENT PROTECTED BY CARDBOARDS IN A STRONG PARCEL. The item "THE THING CARPENTER / RUSSELL ORIGINAL LARGE FRENCH MOVIE POSTER" is in sale since Sunday, July 3, 2016. This item is in the category "Entertainment Memorabilia\Movie Memorabilia\Posters\Originals-International\1980-89". The seller is "fmp2000" and is located in PARIS.